Easy Slow Cooker Recipes - 5 Ingredients or Less! 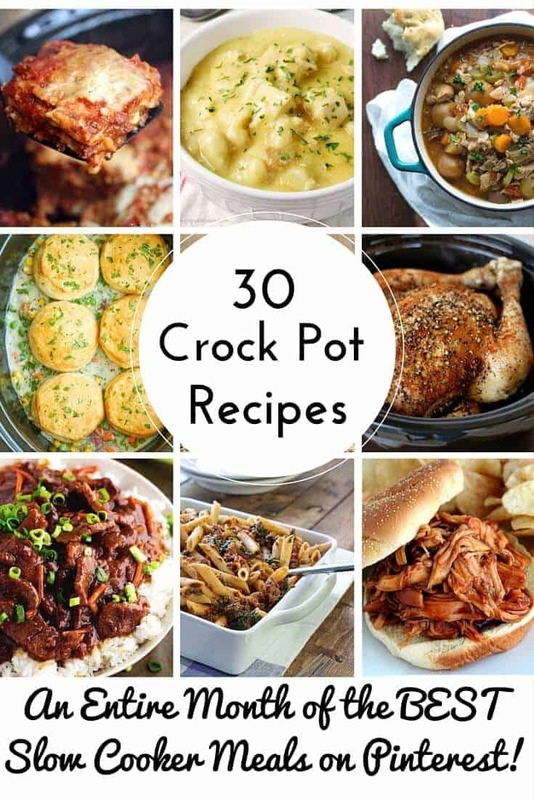 Home » Recipes » Method » Crockpot » 5 Ingredients Slow Cooker Recipes – Quick and Easy Crockpot Recipes! DINNER IS SERVED! 5 Ingredients Slow Cooker Recipes – that’s right, five ingredients are all you need to make these easy crockpot meals! When I think of easy recipes, my mind goes right to my crock pot. There is something about using your slow cooker that makes coming home after a long day magical. Your home has the comforting smell of dinner floating through the air and the entire family knows that nourishment is just a few moments away. What’s even better these 5 ingredients slow cooker recipes! Just have these ingredients on hand, and you can have dinner cooking in the crockpot in no time! Sometimes I see recipes for these amazing crock pot dishes that look so delectable, but their ingredient list is a mile long. Most of our busy schedules, especially hectic mornings don’t afford a ton of time in the morning to prep a good meal for the slow cooker. No worries here. I have searched my treasure trove of recipes and found so many good ones to share and they all require 5 ingredients or less. You’ll find dessert recipes, filling recipes, comfort food dinner recipes and so many more crockpot recipes that are super simple and affordable, too! for TONS of great Slow Cooker Recipes! 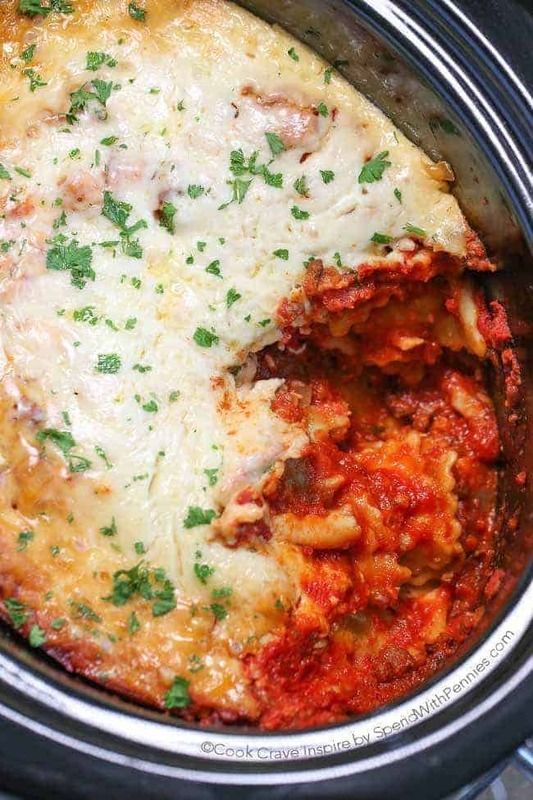 Spend With Pennies has the easiest ever recipe for a Lazy Crock Pot Lasagna. This recipe actually only has three ingredients and one is the crock pot, so it is perfect for anyone to make. I really need to try this one out during the busy holiday season. It looks so good and filling! 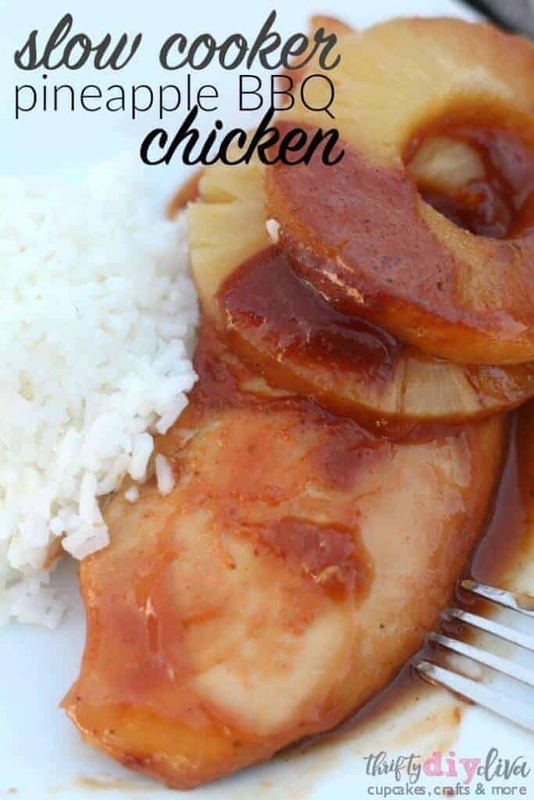 It just doesn’t get an easier than this slow cooker bbq chicken with pineapple. With only three ingredients, anyone can make this delicious dinner. This would be a good recipe to keep in stock for when you have zero time on your hands to throw together a meal. I need to run to the store to pick up enough stuff to make this one. 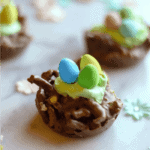 Even the kids could throw this together on a busy morning. Trying to appease your sweet tooth? 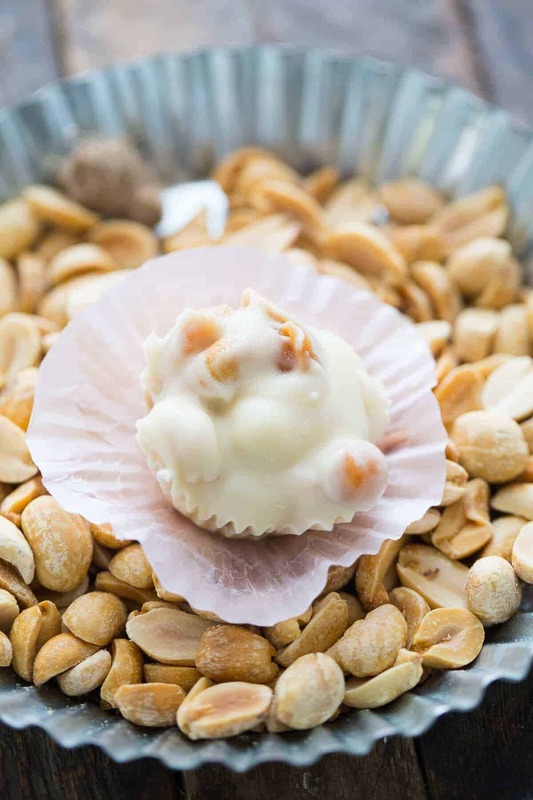 This recipe for crock pot candy is so simple you just won’t believe it! Lemons for Lu Lu shows us how to take just a few ingredients and whip up a batch of delightful homemade candy. This recipe is so easy that you could make this for teachers and neighbors this year for holiday gifts, too! With this next recipe you are going to be armed with a fabulous holiday appetizer that will satisfy the entire family. 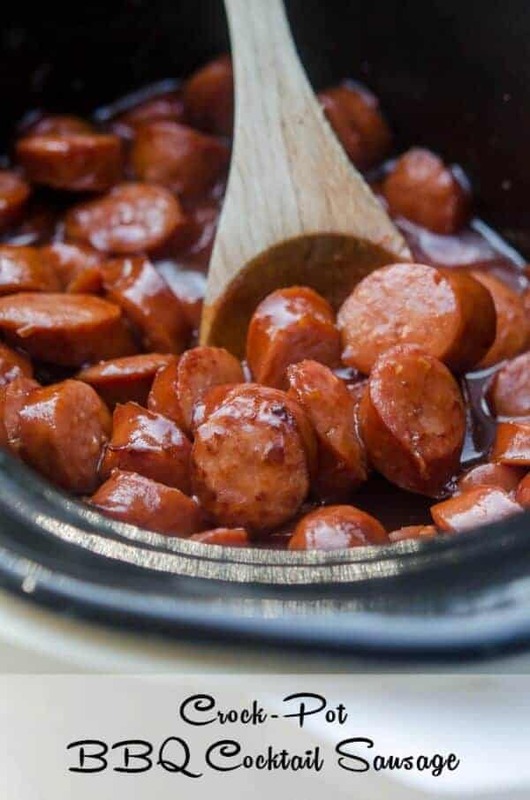 Using only four ingredients, From Valerie’s Kitchen shares her recipe for crock pot BBQ cocktail sausages. This appetizer is a little spicy, a little sweet and a whole lot of yummy! It is also such a great food to serve when watching the big game, too! 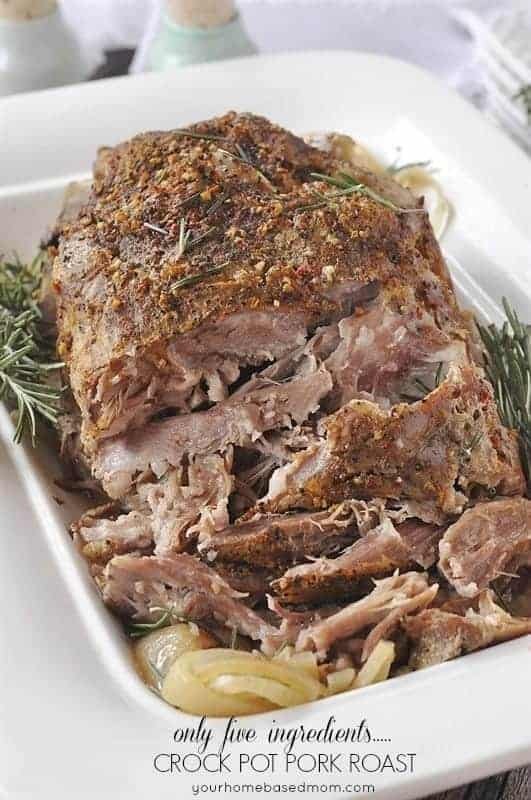 Your Homebased Mom has a Five Ingredient Crock Pot Pork Roast that looks beyond yummy! This is such a great thing to cook because it goes with absolutely everything and is always so good! This is a great idea for a pot luck dish, too! I can’t wait to try her version soon. Like THIS week! 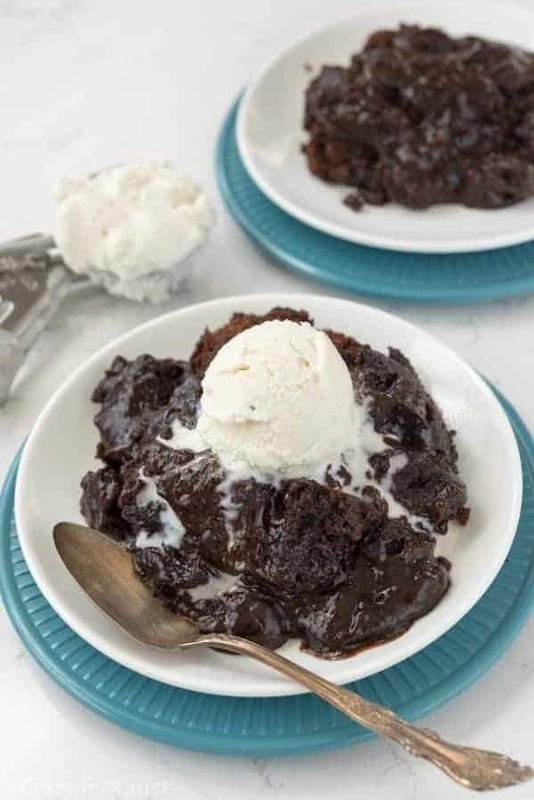 Crazy for Crust has created this amazing recipe for brownie pudding in the crock pot and it looks incredible. There is nothing I enjoy more than a warm chocolate dessert, especially when it is cool and crisp outside. That is my favorite type of comfort food. 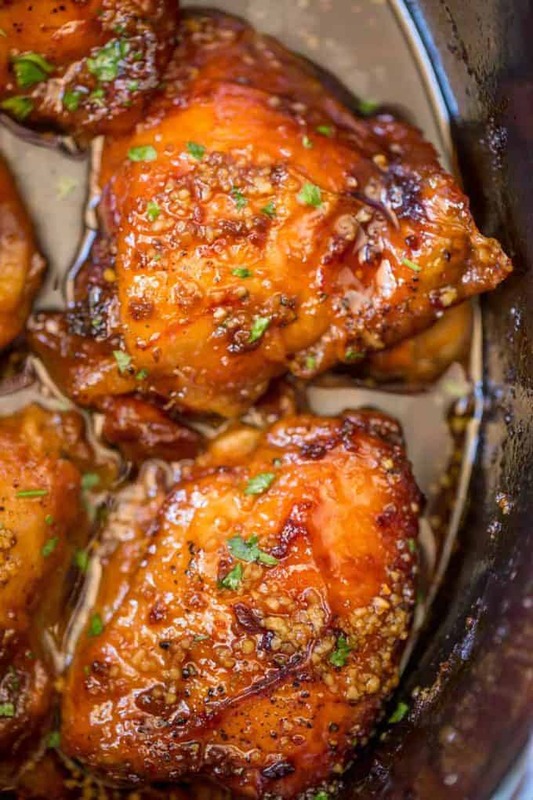 If you love a flavorful chicken dish, this slow cooker brown sugar garlic chicken is just the thing. It is sweet and spicy and looks just incredible. Dinner Then Dessert has me absolutely drooling with this one! I think I’ll try this one out this week for sure! I love making monkey bread. Not only does it have such a fun name, but it is such a yummy breakfast delicacy. 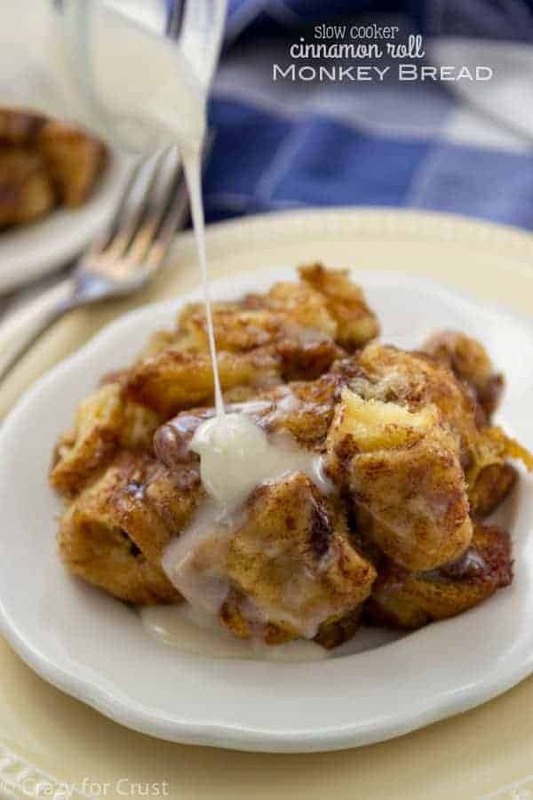 Monkey Bread gives so many opportunities to cover dough with sweetness, but this recipe for cinnamon roll monkey bread by Crazy for Crust gives your ordinary monkey bread an amazing upgrade. Just imagine using cinnamon rolls for the pieces of dough and then drizzling icing all over it after it slow baked in the crock pot for a couple of hours… it looks so so good! 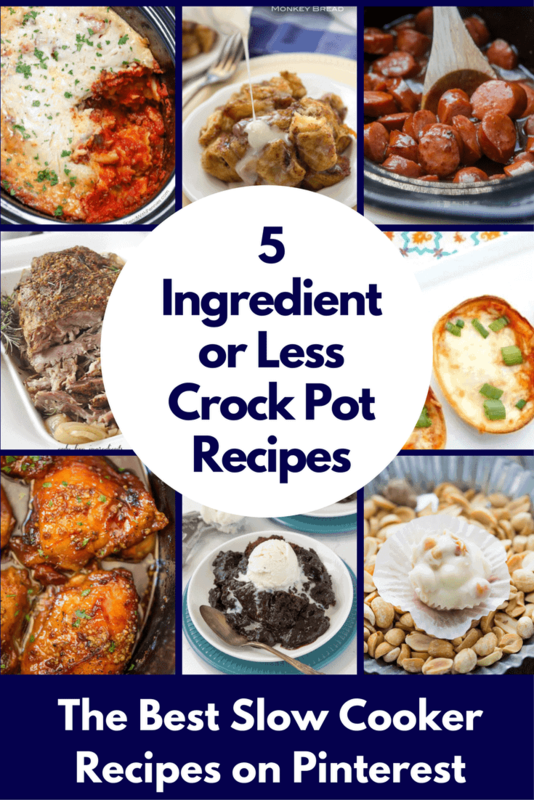 Be sure to pin this collection of 5 Ingredient or Less Crock Pot Recipes. You know you are going to want to come back to it time and time again… they are that good! I think every busy family will agree that planning meals for crazy weeknights can really help their lives run much more smoothly. Having a nice, warm meal on the table will bring a sense of peace to your home and it is so easy to do. There are so many wonderful benefits that using a slow cooker provides for your family. If you like throwing a quick meal in the crock pot, then you will love this post that has an entire month of slow cooker recipes. If fix it and forget it is the way you roll, be sure to check this one out… it is a sure fire great plan for every night during this busy holiday season. Genius DIY Backyard Ideas that will Transform your Yard!